Each night when I get into bed, if I'm not immediately sleepy, this is the book that I pull up to read myself to sleep. Not because it is inherently soporific, but because it is inherently enjoyable. I grew up in the bayous of Louisiana, but for four years in the 1970s I had the pleasure of living in New England, in Thoreau's home state Massachusetts. I lived in the middle of all the flora and fauna that he meets, inspects, and describes during his daily walks through the woods of Concord and its environs. But he walked through them while I, a hundred or so years later, drove through them on the turnpikes at 70 mph, the back roads at 40 mph, and the bike trails at 20 mph on my trail bike. My favorite place was the Foxborough State Forest which was only a couple of trail bike minutes from my home. Often during hectic projects while I was managing the Corporate Software Engineering and Development Department at the Foxboro Co., I would walk home at lunch, a brisk 5 minute walk, hop on my Honda 175 trail bike and head for the forest. Zipping over rocks, streams, up and down narrow trails, barely missing trees on either side of the trail, I'd enjoy the cool air of the forest, park on the broad shady expanse of Flat Rock, and relax for a few minutes, maybe eat my lunch. Then I'd be back at work. Not much time for stopping to inspect plants, or for noting which flowers were blooming during which season. In the winter, I did notice the tracks in the snow left behind by the animals of the forest which I seldom noticed any traces of during the summer. And that leads me to why I enjoy Thoreau so much — he takes me on the walks I didn't allow myself time for during my impetuous, always rushing, youth. He holds up plants and calls them by their names. He tells me what time of year they are blooming. He even describes how many times it snows during a given winter, and how many significant snows there were. When I reached the end of this book, and he talked in February about the winter's snowfalls, I thought back and counted in my head from memory that in the winter of 1852-53 there were two major snowfalls of about 6 inches or more up till that time. I was right! He said that there were two. I remembered because I had encountered those two snowfalls with him during the course of this book. [page 492] But Sunday it snowed about a foot deep, — with our second, only, important snow this winter, — . . .
What astounded me was the thought that I now have a stronger memory of the snows of a winter 150 years ago than I do of winters only 30 years ago! A stronger memory of a winter I read about in a book than one that I experienced in person. We are in the middle of a political campaign for president of this country. The incumbent Bush is running against the challenger Kerry. The names don't really matter, it's always two candidates, an incumbent against a challenger. In this next passage, I will replace Thoreau's "Haynes" by "Bush" and "Kossuth" by "Kerry" for effect. Read the passage and see if you don't agree with me that Thoreau could well have been talking about the current political campaign. [page 15] May 4.R. W. E. [RJM: Emerson] tells me he does not like Bush as well as I do. I tell him that he makes better manure than most men. This excitement about Kerry is not interesting to me, it is so superficial. It is only another kind of dancing or of politics. Men are making speeches to him all over the country, but each expresses only the thought, or the want of thought, of the multitude. No man stands on truth. [RJM: italics added] They are merely banded together as usual, one leaning on another and all together on nothing; as the Hindus made the world rest on an elephant, and the elephant on a tortoise, and had nothing to put under the tortoise. You can pass your hand under the largest mob, a nation in revolution even, and, however solid a bulk they may make, like a hail-cloud in the atmosphere, you may not meet so much as a cobweb of support. They may not rest, even by a point, on eternal foundations. But an individual standing on truth you cannot pass your hand under, for his foundations reach to the center of the universe. So superficial these men and their doings, it is life on a leaf or a chip which has nothing but air or water beneath. I love to see a man with a tap-root, though it make him difficult to transplant. It is unimportant what these men do. Let them try forever, they can effect nothing. Of what significance the things you can forget? A little thought is sexton to all the world. A few thoughts on the above passage. Thoreau is a man with a tap-root. A few years ago my wife, Del, was offered a job as Vice-President of a company in Atlanta, which would have required us to move from New Orleans. She turned the job down this way. She asked the interviewer, "Did you ever try to transplant a 50-year-old oak?" and then added, "Well, I'm married to one, and he isn't moving." Thoreau aptly sums up politicians with this short sentence, "No man stands on truth." Not standing on truth means lacking a tap-root, becoming one who blows hither and thither as the political winds blow. However politicians try, they speak in this season of things you can forget, things that can effect nothing but getting them elected or re-elected. sexton n. an officer having the care of a church, its vessels, vestments, etc., and frequently acting as parish clerk and a gravedigger. What is Thoreau driving at? A thought is to the world as a sexton is to the church. Even a little thought takes care of the world, acts as a world clerk, and buries its dead. That's the best I can do with my limited knowledge of a sexton's duties. But whether I'm correct in my interpretation of what Thoreau meant, I can definitely see Thoreau as a sexton to the world of nature, a sexton who walks the grounds of his assigned estate, inspects its vessels, and vestments, and takes appropriate action when one of his charges requires interment. It is a holy job, this roaming sexton has, and he permits us, the reader, to accompany him on his sacred rounds. [page 19] As I can throw my voice into my head and sing very loud and clear there, so I can throw my thought into a higher chamber, and think louder and clearer above the earth than men will understand. Or maybe not. He interposes such thoughts in between young oaks which have "lost all their leaves" and tree toads. [page 20] In its America of enterprise and active life, does not the mind lose its adipose tissue that Knox tells of? Or between tree toads and saxifrage when he talks below using a sense of the intransitive verb, recur, that requires another flick through my Cassel's: to return to in thought. He seems to be saying he must wait a day or two before he writes down his experiences in his journal, so that he gets enough distance to obtain a perspective, but not longer than that, if his writing is to maintain the freshness he likes best. [page 20] I succeed best when I recur to my experience not too late, but within a day or two; when there is some distance, but enough of the freshness. One needs to keep a dictionary close by when reading Thoreau, who often used familiar words in an unfamiliar way, such as his usage of the verb improve in the next two passages, in sense of "to make the best use of". How concise is this archaic use of "improve" and how preferential over our modern truncation of its colloquial meaning. In the third passage note the curious usage of "advertised" -- how odd it falls upon our ear. [page 23] I hear Barrett's sawmill running by night to improve the high water. [page 110] Is there any fog in a sultry night? The prudent farmer improves the early morning to do some of his work before the heat becomes too oppressive, while he can use his oxen. As yet no whetting of the scythe. The morning is ambrosial, but the day is a terrestrial paradise. Ah, the refreshing coolness of the morning, full of all kinds of fragrance! [page 308] From this hill I count five or six smokes, far and near, and am advertised of one species of industry over a wide extent of the country. Likewise for his reference to the yellow umbrels of the primose known as cowslips that adds their color to the cows' cream and creates the first yellow butter of the Spring. [page 27] Cowslips show at a distance in the meadow (Miles's). The new butter is white still, but with these cows' lips in the grass it will soon be yellow, I trust. Imagine yourself as a humblebee or hummingbird whose life depends on flowers, if you would understand Thoreau. [page 34] The first humblebee, that prince of hummers, — bombyle [sic], looking now over the ground as if he could find something. He follows after flowers. To have your existence depend on flowers, like the bees and hummingbirds! Have you lived so long or so close to the Earth that you depend on the indigenous foods of your area to pull you through the year? If so, you may consider yourself able company for Thoreau on his walks. [page 36] No tarts that I ever tasted at any table possessed such a refreshing, cheering, encouraging acid that literally put the heart in you and set you on edge for this world's experiences, bracing the spirit, as the cranberries I have plucked in the meadows in the spring. They cut the winter's phlegm, and now I can swallow another year of this world without other sauce. [RJM: italics added] Even on the Thanksgiving table they are comparatively insipid, have lost as much flavor as beauty, are never so beautiful as in water. One must also be careful when visualizing images such as in this next sentence from page 38. Read it and create a visual image: "Saw a load of rock maples on a car from the country." Did you visualize a railroad car? If not, remind yourself that automobiles were not invented before 1900 or so, some fifty year after the time Thoreau is writing about. 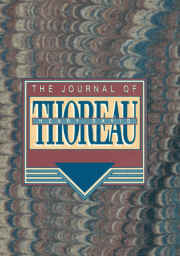 Thoreau walked through unimproved areas of his environment and likened the areas he trod as "widow's thirds" — a phrase that stems from a time when a widow was automatically given one-third of her husband's estate and might be able to employ only one hired hand to attend to it as best he could. [page 77] The lupine, which I saw almost in blossom a week ago at Plymouth, I hear is in blossom here. The river is my own highway, the only wild and unfenced part of the world hereabouts. How much of the world is widow's thirds, with a hired man to take negligent care of it! Thoreau had a musical instrument which followed him wherever he walked and an itinerant minstrel, the wind, who played upon it, namely, the telegraph harp. When the wind blew, it cause the telegraph wires strung between poles to sing in melodies and chords, and this was known as the telegraph harp. I will note below a few of the passages where he mentions the singing accompaniment to his solitary walks abroad. [page 80] The constant inquiry which nature put is: "Are you virtuous? Then you can behold me." Beauty, fragrance, music, sweetness, and joy of all kinds are for the virtuous. That I thought when I heard the telegraph harp today. [page 410] The winds of autumn draw a few strains from the telegraph, after all. At this post it is only a musical hum, but at the next it attains to clearness and reminds me of the isles of Greece. I put my ear to the post. Every fibre resounded with the increasing inflatus, but when it rose into a more melodious and tenser note it seemed to retire and concentrate itself in the pith of the wood. [page 458, 459]The telegraph harp again. Always the same unrememberable revelation it is to me. It is something as enduring as the worm that never dies. Before the [sic] it was, and will be after. I never hear it without thinking of Greece. How the Greeks harped upon the words immortal, ambrosial! They are what it says. It stings my ear with everlasting truth. It allies Concord to Athens, and both to Elysium. It always intoxicates me, makes me sane, reverses my views of things. I am pledged to it. I get down the railroad till I hear that which makes all the world a lie. When the zephyr, or west wind, sweeps this wire, I rise to the height of my being. A period - a semicolon, at least - is put to my previous and habitual ways of viewing things. This wire is my redeemer. It always brings a special and a general message to me from the Highest. Day before yesterday I looked at the mangled and blackened bodies of men which had been blown up by powder, and felt that the lives of men were not innocent, and that there was an avenging power in nature. Today, I hear this immortal melody, while the west wind is blowing balmily on my cheek, and methinks a roseate sunset is preparing. Are there not two powers? [page 473] Returning, I thought I heard the creaking of a wagon just starting from Hubbard's door, and rarely musical it sounded. It was the telegraph harp. It began to sound but at one spot only. It is very fitful, and only sounds when it is in the mood. You may go by twenty times, both when the wind is high and when it is low and let it blow which way it will, and yet hear no strain from it, but another time, at a particular spot, you may hear a strain rising and swelling on the string, which may at last ripen to something glorious. The wire will perhaps labor long with it before it attains to melody. Nature was the temple in which Thoreau worshiped and one can imagine he is talking about himself when he calls to mind for us the ancient druids. He uses the word fane in this next passage which means sacred place or temple, which definition helps us to understand the word pro-fane to mean "outside or in front of the sacred place". We may speak only sacred words in the temple, but outside we may speak profane words or profanity. [page 84] The priests of the Germans and Britons were druids. They had their sacred oaken groves. Such were their steeple houses. Nature was to some extent a fane to them. There was fine religion in that form of worship, and Stongehenge remains as evidence of some vigor in the worshipers, as the Pyramids, perchance, of the vigor of the Egyptians, derived from the slime of the Nile. Evelyn says of the oak, which he calls these "these robust sons of the earth," "It is reported that the very shade of this tree is so wholesome, that the sleeping, or lying under it, becomes a present remedy to paralytics, and recovers those whom the mistaken malign influence of the Walnut-tree has smitten. Every now and then Thoreau slips in a bit of homespun advice, such as this one on employment, which would be lost on the Dilbert business world of today. [page 101] Do not hire a man who does your work for money, but him who does it for love, and pay him well. You gotta love the way Thoreau travels the world — he doesn't need a steamship or a railroad train or a caravan — he has his imagination. Wherever he sits is where the lotus grows, rightly understood. [page 102] How refreshing the sound of the smallest waterfall in hot [weather)! I sit by that on Clematis Brook and listen to its music. The very sight of this half-stagnant pond-hole, drying up and leaving bare mud, with the pollywogs and turtles making off in it, is agreeable and encouraging to behold, as if it contained the seeds of life, the liquor rather, boiled down. The foulest water will bubble purely. They speak to our blood, even these stagnant, slimy pools. It, too, no doubt, has its falls nobler than Montmorenci, grander than Niagara, in the course of its circulations. Here is the primitive force of Egypt and the Nile, where the lotus grows. In case anyone take the impression that Thoreau did not appreciate the more civilized music of man as much as the wild telegraph harp played by itinerant zephyrs, I include this next passage about someone of a night playing a clarinet. Thoreau likens it to a flower in bloom. Can one hear Artie Shaw, Benny Goodman, or Pete Fountain again without imagining the bouquets of flowers they produce from the bell of their clarinets? [page 114] I hear a man playing a clarionet far off. Apollo tending the flocks of King Admetus. How cultivated, how sweet and glorious, is music! Men have brought this art to great perfection, the art of modulating sound, by long practice since the world began. What superiority over the rude harmony of savages! There is something glorious and flower-like in it. What a contrast this evening melody with the occupations of the day! It is perhaps the most admirable accomplishment of man. I grew up in South Louisiana in those days when we exercised of an evening in the summer by swatting and slapping mosquitos. Those days are gone with the advent of mosquito spraying, but one concomitant casualty has been the disappearance of fireflies, which we always called "lightning bugs" — even though we knew they were called fireflies by others. Thoreau would have liked our usage of the name "lightning bugs". [page 129] More thunder-storms threaten, and I still can trace those that are gone by. The fireflies in the meadows are very numerous, as if they had replenished their lights from the lightning. As I read this next passage I was able to understand for the first time the veracity of an old saying. I can even predict that this saying is true only for areas of the Earth subject to prevailing westerly wind flows such as our Northern Hemisphere. Here's how it works: if you see a rainbow in the morning, the rainbow must be in the Western sky, the opposite side of the sky from the sun. Rainbows only occur when rain is falling and the sun is shining on the drops. A westerly wind will bring the rain to where you are located sometime during the day — thus sailors have learned to be forewarned by a rainbow in the morning! At night or evening, a rainbow would appear in the Eastern sky, indicating the storm has already passed, and the mere appearance of a rainbow is a sign that the Western sky is clear or no sun's rays would be present to create a rainbow — thus sailors may expect clear skies and good sailing the night through and the next day. [page 141] Just as the sun was rising this morning, under clouds, I saw a rainbow in the west horizon, the lower parts quite bright. A few moments after, it rained heavily for a half-hour; and it has continued cloudy as well as cool most of the day. Thoreau doesn't just write, he paints with words. This next passage reveals his attention to this aspect of his writing and his intention is crystal clear. He wants to add darkness, not to his nightly walks, but to our images of them as we read — he intends us to create a dark Tintorretto not a bright Cezanne with his words. [page 147] June 26. I have not put darkness, duskiness, enough into my night and moonlight walks. Every sentence should contain some twilight or night. At least the light in it should be the yellow or creamy light of the moon or the fine beams of stars, and not the white light of day. The peculiar dusky serenity of the sentences must not allow the reader to forget that it is evening or night, without my saying that it is dark. Otherwise he will, of course, presume a daylight atmosphere. Thoreau paints with such metaphors in the penultimate sentence of this next passage as he refreshes himself from a flowing spring. [page 188] How cheering it is to behold a full spring bursting forth directly from the earth, like this of Tarbell's, from clean gravel, copiously, in a thin sheet; for it descends at once, where you see no opening, cool from the caverns of the earth, and making a considerable stream. Such springs, in the sale of lands, are not valued for as much as they are worth. I lie almost flat, resting my hands on what it offers, to drink at this water where it bubbles, at the very udders of Nature, for man is never weaned from her breast while this life lasts. How many times in a single walk does he stoop for a draught! Could you live with a composer without wondering what poetry or music is being composed right now? Thoreau likens Nature to such a composer and calls our attention to her compositions in the moment. Do you put flowers and fruit on display in your home? 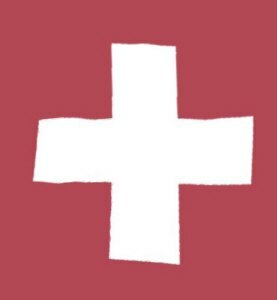 If you do, you are displaying the current compositions of the season of this great composer with whom we are all living at every moment. [page 191] How fitting to have every day in a vase of water on your table the wild-flowers of the season which are just blossoming! Can any house be said to be furnished without them? Shall we be so forward to pluck the fruits of Nature and neglect her flowers? These are surely her finest influences. So may the season suggest the fine thoughts it is fitted to suggest. Shall we say, "A penny for your thoughts," before we have looked into the face of Nature? Let me know what picture she is painting, what poetry she is writing, what ode composing, now. [page 223] July 13. A journal, a book that shall contain a record of all your joy, your ecstasy. Thoreau knew about lively words that expressed his joy, his ecstasy, and he abhorred writers who used dead words, words bereft of direct expression, from whom the life has been squeezed out by the hands of abstraction. Even when he declaims the faults of abstract words, he uses a lively metaphor. Take a ride with Thoreau as he goes berry picking along Walden Pond and encounters a host of yellow butterflies. Is his descriptive power any less than Wordsworth's when he encountered a host of daffodils? [page 226 227] Saw to-day for the first time this season fleets of yellow butterflies dispersing before us, as we rode along berrying on the Walden road. Their yellow fleets are in the offing. Do I ever see them in numbers off the road? They are a yellow flower that blossoms generally about this time. Like a mackerel fleet, with their small hulls and great sails. Collected now in compact but gorgeous assembly in the road, like schooners in a harbor, a haven; now suddenly dispersing on our approach and filling the air with yellow snowflakes in their zigzag flight, or as when a fair wind calls those schooners out and disperses them over the broad ocean. Everywhere one can spot curious usages of words that illuminate their origin. 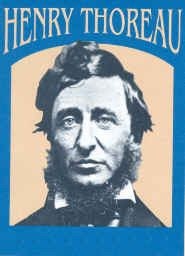 Such as on page 233 when he pens about resuming a boat trip, "Again under weigh" — our current usage of the phrase as "under way" hides as much as it reveals — and my Cassel's still contains the original form used by Thoreau to describe what happens after one weighs anchor — one gets "under weigh" and begins moving again. Perhaps the very origin of our simple word "way" meaning to move comes from this boating metaphor. Or take this one where a familiar metaphor meaning someone getting his due is revealed in its pristine literalness on page 240: "As we go by the farmhouses, the chickens are coming home to roost." Always Thoreau paints his verbal pictures for us with a pallette of adjectives, such as here when we gaze into the reddening sunset alongside him. [page 242] Those small clouds, the rearmost guard of the day, which were wholly dark, are again lit up for a moment with a dull-yellowish glow and again darken; and now the evening redness deepens till all the west or northwest horizon is red; as if the sky were rubbed there with some rich Indian pigment, a permanent dye; as if the Artist of the world had mixed his red paints on the edge of the inverted saucer of the sky. An exhilarating, cheering redness, most wholesome. What are weeds but plants where we don't wish them to be, as some sage once wrote. No doubt, sage itself was once considered a weed, until some one discovered its medicinal properties and later someone else touted its value as a herb for seasoning a stew. But there were no weeds to Thoreau — if there were, he would have to admit himself to be a weed, as some of his neighbors might have considered him since he walked at times where they didn't wish him to be. [page 250, 251] I sympathise with weeds perhaps more than with the crop they choke, they express so much vigor. They are the truer crop which the earth willingly bears. This next passage illustrates how Thoreau acted and thought differently than us. He not only "heard a different drummer" than his fellow men, but he went to a different school. [page 252, 253] There is a coarse, boisterous, money-making fellow in the north part of town who is going to build a bank wall under the hill along the edge of his meadow. The powers have put this into his head to keep him out of mischief, and he wishes me to spend three weeks digging there with him. The result will be that he will perchance get a little more money to hoard, or leave for his heirs to spend foolishly when he is dead. Now, if I do this, the community will commend me as an industrious and hard-working man; but, as I choose to devote myself to labors which yield more real profit, though but little money, they regard me as a loafer. But, as I do not need this police of meaningless labor to regulate me, and do not see anything absolutely praiseworthy in his undertaking, however amusing it may be to him, I prefer to finish my education at a different school. Thoreau tells us about the Attacus luna, one of several large emperor moths which are rarely seen except after they have been eaten by a bird and their wings flutter to the ground. He likens them to poems, those wings of flight which fall to the Earth after the poet has eaten the succulent morsel which powered the flight. Imagine each line of metric verse to be a wing, a lifeless thing on a page, which can only again take flight when powered by the spirit of a quickened reader and re-display for the reader and audience its pre-Fall glory! Or, do as Thoreau suggests, and imagine poems, even his own lyrical prose or Homer's epic verse, as the fallen wings evincing a flight of a poet whom Death, the "ravenous vulture of the world" has snapped up. [page 259] So most poems, even epics, are like the wings come down to earth, while the poet whose adventurous flight they evidence has been snapped up by the ravenous vulture of this world. Thoreau was alone often as he walked through the woods, but we get the sense that he was alone also in the company of others. He longed for true clarity in a world which seems to darken meanings rather than reveal them, to hide intimacy rather than reveal it. He included himself in this next metaphor of the squid or cuttlefish, which protects itself by hiding within a murky ink as it moves about in the world. [page 315] Like a cuttlefish, we conceal ourselves, we darken the atmosphere in which we move; we are not transparent. I pine for one to whom I can speak my first thoughts; thoughts which represent me truly, which are no better and no worse than I; thoughts which have the bloom on them, which alone can be sacred and divine. Our sin and shame prevent our expressing even the innocent thoughts we have. I know of no one to whom I can be transparent instinctively. I live the life of the cuttlefish; another appears, and the element in which I move is tinged and I am concealed. My first thoughts are azure; there is a bloom and dew on them; they are papillaceous feelers which I put out, tender, innocent. Only to a friend can I expose them. Much as he liked clarity in people, he liked some tint in the landscape around him. Maybe it seemed to him that the tint of distant objects helped to bring the nearer objects into sharper focus. This is something film-makers use to their advantage when they employ smoke machines to pervade a scene with a light mist before shooting it. [page 350] In my ride I experienced the pleasure of coming into a landscape where there was more distance and a bluish tinge in the horizon. I am not contented long with such narrow valleys that all is greenness in them. I wish to see the earth translated, the green passing into blue. How this heaven intervenes and tinges our more distant prospects! The farther off the mountain which is the goal of our enterprise, the more of heaven's tint it wears. This is the chief value of a distance in landscapes. In the winter time Thoreau bemoans that not only is the water too cold for bathing in the river, but there are few plants to be observed in it. But each time he grabs a log for his hearth, he has a wealth of nature at his finger tips. [page 363] It is not in vain, perhaps, that every winter the forest is brought to our doors, shaggy with lichens. Even in so humble a shape as a wood-pile, it contains sermons for us. This next metaphor needs a bit of explaining, if you are not a duck hunter. To hit a bird on the wing, one must shoot ahead of where the bird is flying, i.e., "on the wing". You must accurately gauge its speed versus the speed of the pellets from your shotgun so that the two may meet in time at the same place. [page 359] My friend is he who can make a good guess at me, hit me on the wing. A stranger, on the other hand, can make no good guess, but makes a guess nevertheless, and takes us for something other than we are. Thoreau seemed to feel that "two's company, three's a crowd, and more is a litter of pigs." [page 397] My friend is one whom I meet, who takes me for what I am. A stranger takes me for something else than I am. We do not speak, we cannot communicate, till we find that we are recognized. The stranger supposes in our stead a third person whom we do not know, and we leave him to converse with that one. It is suicide for us to become abetters in misapprehending ourselves. Suspicion creates the stranger and substitutes him for the friend. I cannot abet any man in misapprehending myself. [page 425] If, by living thus "reserved and austere" like a hermit in the woods so long, it has acquired such wonderful depth and purity, who would not regret that the impure waters of Flint's Pond should be mingled with it, or itself should go waste its sweetness in the ocean? Have you ever observed railroad cars as they rush past you at an intersection? Does something about their passage remind you of your life? Always on the go, from one task to another in a hurried pace? Thoreau's advice is to "Keep the time, observe the hours of the universe, not of the cars." [page 433] It is worth the while to apply what wisdom one has to the conduct of his life, surely. I find myself oftenest wise in little things and foolish in great ones. That I may accomplish some particular petty affair well, I live my whole life coarsely. A broad margin of leisure is as beautiful in a man's life as in a book. Haste makes waste, no less in life than in housekeeping. Keep the time, observe the hours of the universe, not of the cars. What are threescore years and ten hurriedly and coarsely lived to moments of divine leisure in which your life is coincident with the life of the universe? We live too fast and coarsely, just as we eat too fast, and do not know the true savor of our food. We consult our will and understanding and the expectation of men, not our genius. I can impose upon myself tasks which will crush me for life and prevent all expansion, and this I am but too inclined to do. One moment of life costs many hours, hours not of business but of preparation and invitation. Yet the man who does not betake himself at once and desperately to sawing is called a loafer, though he may be knocking at the doors of heaven all the while, which shall surely be opened to him. That aim in life is highest which requires the highest and finest discipline. How much, what infinite, leisure it requires, as of a lifetime, to appreciate a single phenomenon! You must camp down beside it as for life, having reached your stand for the whole world to you, symbolical of all things. The least partialness is your own defect of sight and cheapens the experience fatally. Unless the humming of a gnat is as the music of the spheres, and the music of the spheres is as the humming of a gnat, they are naught to me. It is not communications to serve for a history,-- which are science, — but the great story itself, that cheers and satisfies us. Thoreau manages to describe the indescribable by his own admission as in this picture he paints of a winter sky. [page 468] Ah, our indescribable winter sky, pure and continent and clear, between emerald and amber, such as summer never sees! What more beautiful or soothing to the eye than those finely divided or minced clouds, like down or loose-spread cotton-batting, now reaching up from the west above my head! Beneath this is a different stratum, all whose ends are curved like spray or wisps. All kinds of figures are drawn on the blue ground with this fibrous white paint. There are mornings when the world seems to burst open and pour forth a sea of creativity in our world. What else can we call these "mornings of creation," but "the poet's hour"? [page 478] Mornings of creation, I call them. In the midst of these marks of a creative energy recently active, while the sun is rising with more than usual splendor, I look back, — I look back for the era of this creation, not into the night, but to a dawn for which no man ever rose early enough. A morning which carries us back beyond the Mosaic creation, where crystallizations are fresh and unmelted. It is the poet's hour. Mornings when men are new-born, men who have the seeds of life in them. It should be a part of my religion to be abroad then. This is not one of those mornings, but a clear, cold, airy winter day. I remember a day fishing with my dad in Bayou Barré under blue canopied sky. Our boat floated in the shallow bayou between masses of paralleled spires of short marsh grass that unrolled as a green carpet to the flat horizon all around us. It was so quiet we could hear the oysters talking. As the undulating waves from the slow rocking of our drifting boat rolled towards the oyster reefs near the edge of the bayou, the oysters closed their shells in an unsyncopated rhythm rather like chickens pecking in the yard. Over us a stately mass of white pelicans floated, and as they passed, the flock rotated majestically like a huge white pinwheel in slow motion, an ultra-slow motion which held us in thrall, held our breath, and kept our eyes transfixed until they passed. Did we catch fish that day? Probably. Do I remember the fish? No way. I returned home with a catch that was invaluable — this memory. [page 480] It is remarkable that many men will go with eagerness to Walden Pond in the winter to fish for pickerel and yet not seem to care for the landscape. Of course it cannot be merely for the pickerel they may catch; there is some adventure in it; but any love of nature which they may feel is certainly very slight and indefinite. They call it going a-fishing, and so indeed it is, though, perchance, their natures know better. Now I go a-fishing and a-hunting every day, but omit the fish and the game, which are the least important part. I have learned to do without them. They were indispensable only as long as I was a boy. I am encouraged when I see a dozen villagers drawn to Walden Pond to spend a day in fishing through the ice, and suspect that I have more fellows than I knew, but I am disappointed and surprised to find that they lay all the stress on the fish which they catch or fail to catch, and on nothing else, as if there were nothing else to be caught. Were Thoreau's fishermen wise because they measured the value of the time they spent in terms of the fish they caught? You decide. Thoreau makes it clear that the world is populated with many who are appear to be wise in this counting-house way. [page 486] A man is wise with the wisdom of his time only, and ignorant with its ignorance. Observe how the greatest minds yield in some degree to the superstitions of their age. Some people may think that Thoreau was a savage to have spent so much time in the woods rather than in the work of civilization. It is true that he spent a lot of time in the wood, in the sylvan woods, and Thoreau himself helps us to learn the etymology of the word "savage" is in the word "sylvan" which means wooded. Thoreau was undoubtedly a salvage, a man of the woods. [page 494] I think myself in a wilder country, and a little nearer to primitive times, when I read in old books which spell the word savages with an l (salvages), like John Smith's "General Historie of Virginia, etc.," reminding me of the derivation of the word from sylva. There is some of the wild wood and its bristling branches left in their language. The savages they described are really salvages, men of the woods. Are we to regret that Henry David Thoreau has gone since to waste his sweetness in the ocean? Yes but, so long as these journals of his remain, his sweetness will provide ample nourishment for the souls who drink deeply of the ambrosia within these journals' covers. I would like to say more about Thoreau, but another journal awaits, and I must be off into the woods — my companion and guide awaits my pleasure.